Includes wooded building site, wildlife, waterway and farm land! Great commuter location. North ½ of the Northeast ¼ Section 21 of Helen Township, Minnesota. Franke Family Trust, owners. Preview Date & Times: Wednesday, November 23 from noon to 4:00 p.m. or by private showing. (Please view complete listing for auction terms specific to this property.) 1. Each property is offered under the specific terms & conditions provided in the printed and electronic versions of the auction brochure. Please read and review the brochure thoroughly prior to bidding on any property. The purchase contract includes the brochure language and adopts the Terms and Conditions. If you have not read and reviewed the auction brochure or do not completely accept the terms and conditions - Do Not Bid. 2. Terms: non refundable earnest money in the form of a certified check, cash or wire transfer within 24 hours of the close of auction, with the balance of purchase price due at closing. Purchaser shall be responsible for all wire transfer fees. Closing will be specified in the auction brochure. There will be a buyer’s premium added to the bid price to arrive at the final purchase price. Example: Bid Price $100,000 plus an 8% buyer’s premium equals a contract purchase price of $108,000. Buyers premium will vary. Actual premium will be stated in the auction brochure. All online only auctions are a cash sale unless otherwise specified and are not contingent on or subject to financing, appraisal, survey or inspections of any kind, as agreed to by bidders at registration prior to bidding and specified in the auction brochure. 3. Auction End Times: Fahey Sales Online Only Auctions are timed events and all bidding will close at a specified time. Fahey Sales Online Only Auctions also have an auto extend feature. Any bid placed in the final minutes of an auction will cause the auction ending to be automatically extended from the time the bid was placed. Example: if an auction scheduled to close at 6:00 receives a bid at 5:59, and the extended bidding time for that auction is 2 minutes, the close time will automatically extend to 6:01. The auto extends feature remains active until no further bids are received within the specified time frame. Auction company employees and/or Auction Company may bid on auction items. 4. Sold to Highest Bidder Unless Seller's Reserve: All properties in the auction will be sold to the highest bidder unless the seller has a minimum reserve price. In this case the bid price is subject to the seller's confirmation or the reserve may be disclosed in the auction brochure. In some cases, the auctioneer may bid on behalf of the seller to protect the reserve. Disputes over the winning bid price or any other problem will be settled according to records kept by Fahey Sales. 5. Acceptance of Bid Prices: Successful bidder(s) will be required to enter into a purchase agreement immediately following the close of the auction. Fahey Sales and or the listing agent will make arrangements to immediately meet with the successful bidder or e-mail documents to be executed and faxed or e-mailed back to Fahey Sales and or the listing agent within 24 hours of the end of the auction. Bidder(s) will also sign an Agency disclosure and appropriate addendums. Successful bidders not executing and returning contracts with earnest money deposit within 24 hours will be considered in default. Any and all inspections that a buyer may want must be done at buyer's expense prior to auction. 6. Agency: representatives of Fahey Sales Auctioneers and Appraisers are licensed real estate agents with Edina Realty in Minnesota and represent the seller in these real estate transactions. 7. Bidder Verification: All bidders must provide their full name, address and daytime/evening phone number. Fahey Sales reserves the right to deny registration. The identity of all bidders will be verified, bidding rights are provisional, and if complete verification is not possible, Fahey Sales will reject the registration, and bidding activity will be terminated. The Seller and Selling Agents and Auction Company reserve the right to preclude any person from bidding if there is any question as to the person's credentials, fitness, etc. Bidders agree to keep their username and password confidential as they are responsible for ANY and ALL activity involving their account. When using the web site you must obey any and all local state and federal laws. Violations will result in termination of web site use privileges. 8. Property Offerings and Removals: Fahey Sales, according to its discretion, may offer property by the piece, acre, unit or by the lot. The seller, with the consent of Fahey Sales, has the right to remove a property from the auction before bidding is completed. 9. Auction Participation and Compliance with Terms: By participating in an auction, bidders represent, irrefutably warrant and covenant that: -They shall not misrepresent their ability to close the transaction pursuant to the terms and conditions of the auction. -They have the capacity to close the transaction and that any bid they make on the item constitutes an irrevocable offer to buy the item for the full amount of the bid plus buyer's premium and applicable taxes. -They have the legal authority to enter into an agreement to purchase the item. -They shall forfeit all deposits or otherwise pay as liquidation damages all monies paid if payment is not made in full by the time specified. 10. Auction Participation and Bidding Errors: Immediate notification is required if a mistake is made in bidding. Bidders may still be held responsible for the bid. 11. NEW DATA, CORRECTIONS, AND CHANGES: Please log in prior to scheduled bid closing time to inspect any changes, corrections, or additions to the property information. 12. Disclaimer & Absence of Warranties: All information contained in the auction brochure and all related materials are subject to the terms and conditions outlined in the Purchase Agreement. The property is being sold on an 'AS IS, WHERE IS' basis, and no warranty or representation either expressed or implied, concerning the property is made by the Seller, Sellers Agent or the Auction Company. All sketches and dimensions in the brochure are approximate. Each potential bidder is responsible for conducting his or her own independent inspections, investigations, inquiries, and due diligence concerning the property. The information contained in the brochure is subject to verification by all parties relying on it. No liability for its accuracy, errors, or omissions is assumed by the Seller, Sellers Agent or the Auction Company. Conduct of the auction and increments of bidding are at the direction and discretion of the Auctioneer. All decisions of the Auction Company are final. By bidding on the property at auction, buyer agrees to all terms and conditions set forth here and in the auction brochure as well as those set at beginning of the auction. 13. Each buyer is responsible to conduct their own due diligence on the property before bidding. 14. Acknowledgment of Dangerous Auction Site: Potential bidders when inspecting and high bidders/purchasers or their agents acknowledge that an auction site is a potentially dangerous place. Every person enters the auction site at his or her own risk with notice of the condition of the premises and the activities that will be or have been conducted on the premises. High bidders will so advise their agents and employees. This acknowledged risk extends into all activities involved in the inspection of the subject property and preparation of the property for closing, including disconnection of utilities. Persons attending the auction site during preview, sale or inspection assume all risks of injury damage or loss of property and specifically release Fahey Sales, the seller and their agents from liability. 15. Malfunction, Shutdown, and Loss of Service: The results of the auction may be rendered void if malfunction, shutdown, or temporary loss of service occurs. In such an event, Fahey Sales reserves the right to remedy the situation in whichever way best represents the seller, including the cancellation of existing bids. Fahey Sales shall not be held liable in any way for any malfunctions, shutdowns, or loss of service. Bidder acknowledges and understands that this service may or may not function correctly at the close of the auction. Under no circumstances shall Bidder have any kind of claim against Fahey Sales or anyone else if the internet service fails to work correctly during the close of the auction. Fahey Sales will not be responsible for any missed bids from any source. Internet bidders who desire to make certain their bid is acknowledged should use the maximum bidding feature and leave their maximum bid 24 hours before the close of the auction. 16. Erroneous Reports: It is very possible during an auction that an Internet bidder may be indicated as a high bidder when in fact the winner attended the auction in person or vice versa. The auction company makes final determination and holds the official records of winning bidders and final hammer prices. The listings on this website regarding final hammer prices and winning bidders are unofficial. 17. Indemnification and Acceptance of Auction Terms by Bidders: Purchaser and Bidders agree to indemnify and hold harmless both the seller, their agent and Fahey Sales from and against all claims and liabilities resulting from any online auction, including but not limited to: proximate or consequential damages, failure to comply with local, state, or federal laws, and cost of legal expenses arising there from. No person shall have any claim against Fahey Sales, their respective agents or employees for any injuries sustained or damages to or loss of property that may occur on site. These Terms and Conditions, and all questions with respect to the interpretation of these conditions, shall be governed by and construed in accordance with the internal laws of the State of Minnesota, without regard to conflict of laws provisions. All bidders expressly consent to personal and exclusive jurisdiction in the courts of the State of Minnesota located in Scott County. In bidding, you consent to agreeing with all the Terms and Conditions stated above and any auction specific terms posted on each auction brochure and/or terms emailed to you and or terms posted on www.faheysales.com. WOW! What a great location for your new home. Close to Glencoe, Glencoe Airport and Hwy 212, but private and hidden. Just 30 minutes west of Eden Prairie! 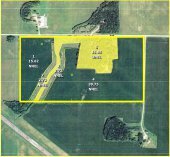 Good farm land to use or rent. Deer, turkeys, pheasants, and chickens?? Older, tear down house and several other buildings. Located in the North of the Northeast Section 21 of Helen Township, Minnesota. Down Payment: $20,000 non-refundable earnest money down on purchase agreement at the close of bidding (Tuesday, November 29, 2016 at 7:00 p.m.). Closing: Remaining payment is due upon closing on or before December 28, 2016. Buyers wishing to close earlier will be accommodated. Seller & Auctioneers Disclaimer: All announcements and updates made by the auctioneer on the website, shall take precedence over any previously written material or oral statements made. Conduct of the auction, increments of the bidding & decisions as to the high bidder will be at the direction & sole discretion of the auctioneer. The information contained in this brochure is subject to the inspection & verification by all parties relying on it; no guarantee, expressed or implied, is given of the information contained in the brochure. No liability for its accuracy, error or omissions is assumed by the owners or the agents. Property sells in as is condition. Buyer will sign an as-is addendum. purchase price. Land will be sold by the acre 80 times the bid. Example: 80 X $7,900 winning bid = $632,000.00 plus buyers premium of 6% = Sale price of $669,920.00. The sale is subject to the sellers confirmation. 1031 tax exchange language can be included in the purchase agreement at the buyers request, however, any 1031 tax exchange shall not alter the terms, conditions, or closing date of this transaction. The seller shall retain the right to lease back the barn and another storage building for up to 12 months. The buyer shall assume and honor the existing land rental contract for the 2017 crop year. The buyer shall assume the CRP contract. The seller retains the right to lease the barn on the property for a minimum of 12 months from the closing date. Taxes: 2016 real estate taxes paid by seller. Broker Participation Accepted But Not Required: A broker referral fee $1,500 will be paid to the buyers agent that registers their client with the auction company prior to the client registering and bidding at www.faheysales.com. Broker registration form and instructions can be found there. DO NOT BID ON THIS LOT. INFORMATIONAL ONLY. The software works and looks best if you use Google Chrome or Firefox as your browser. Do not bid from a smart phone, iPad or tablet. Those items don't update as quickly as a desk top or laptop computer and it may appear you have the high bid when you actually may not. This is especially important while the auction is closing. The software has extended bidding. If someone bids on an item in the last seconds the closing time on that item will extend for 2 minutes. That will continue on that item until there is no activity for 2 minutes. If you are a new user or if you have a slower or unreliable internet connection, we recommend using the maximum bid feature. If you leave your maximum bid, the software will advance you as other people bid. If the bidding stops at an amount less than your maximum bid, then that is all you pay. Unlike other auction companies, we do not have access to your maximum bid, nor does anyone else.